Hold 8-10 Large Sports Balls! 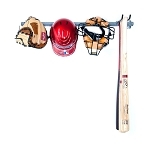 Free shipping to the lower 48 United States for this sports storage rack. If you find yourself traveling from game to game on a Saturday morning in a frantic rush to get to everything on time. Then you probably also know what it feels like to come home to a house that is cluttered with soccer, baseball, football, and basketball equipment all over the floor. 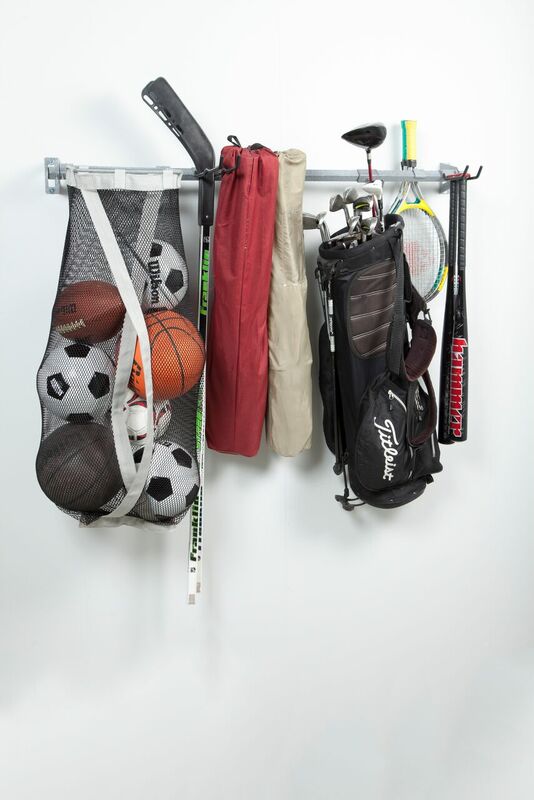 Monkey Bar created an ingenious to conveniently store all your sports equipment. 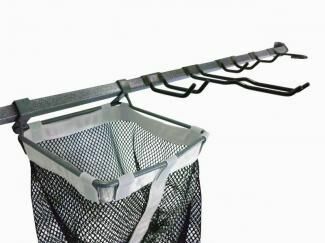 Monkey Bars has put together their most popular hooks to make up a sports rack to hold all types of sporting equipment. This rack will hold 8-10 basketballs, volleyballs, soccer balls, footballs, or many more other sports balls. 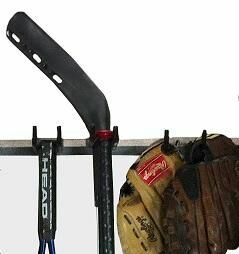 The hooks will hold football pads, baseball gloves and bats, hockey sticks and pads, lacrosse sticks and pads, helmets, tennis racquets, golf bags, and a bike. The rack can store all these types of gear using just 4 feet of wall space. 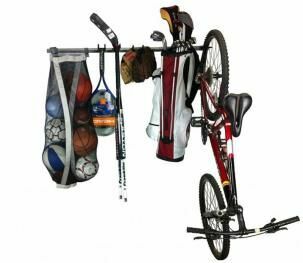 Tripping over sports gear will no longer be a problem because it will all be stored on the wall in one convenient location. 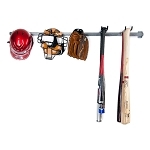 This rack can be configured and adjusted to meet the needs of any sports enthusiast. Installation is easy and only takes 15 minutes. Very few tools are required for installation. 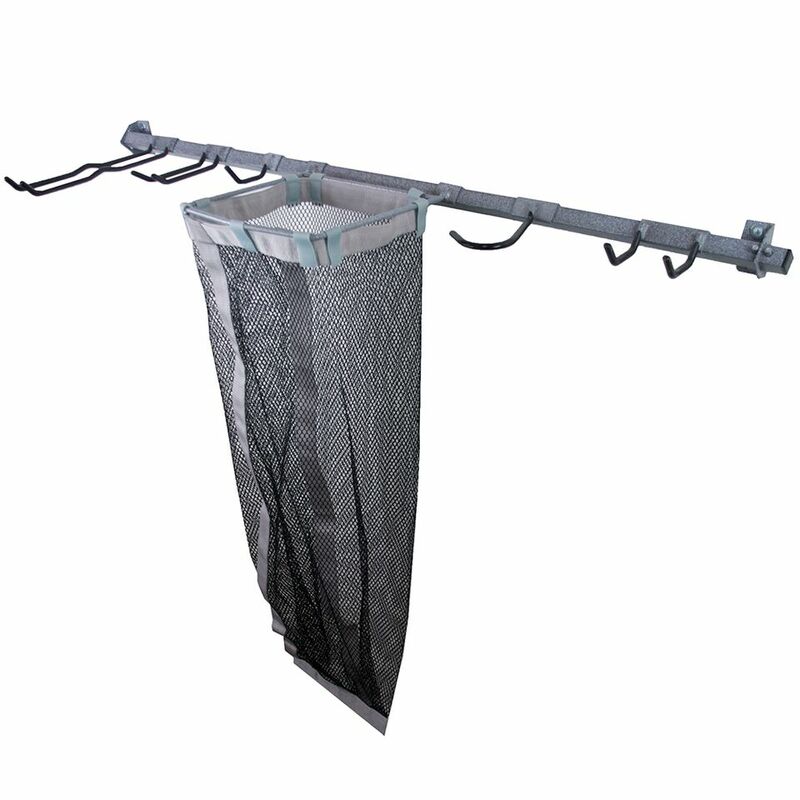 This durable rack comes with a lifetime warranty. Made with powder-coated steel components that will last for years. Hooks slide along the bar for easy adjustability. Holds 8-10 basketballs, footballs, soccer balls, volleyballs and more. Holds all kinds of equipment. 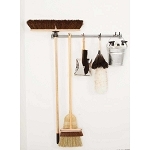 Can be used in a garage, shop, barn, closet, or a shed with wooden walls. Installation can be done quickly in about 15 minutes. Assembled, the unit is just over 4' long and comes out from the wall about 12". Q: How much weight can this rack hold? A: Total weight capacity is 200 pounds. Delivery Details: This product ships directly from the factory in either Rexburg Idaho, or Chattanooga Tennessee, depending on which is closer. This item ships via FedEx and may not require a signature. Simply place the 4 screws into 2 wall studs 24" to 36" apart. The hooks easily snap into place and slide. 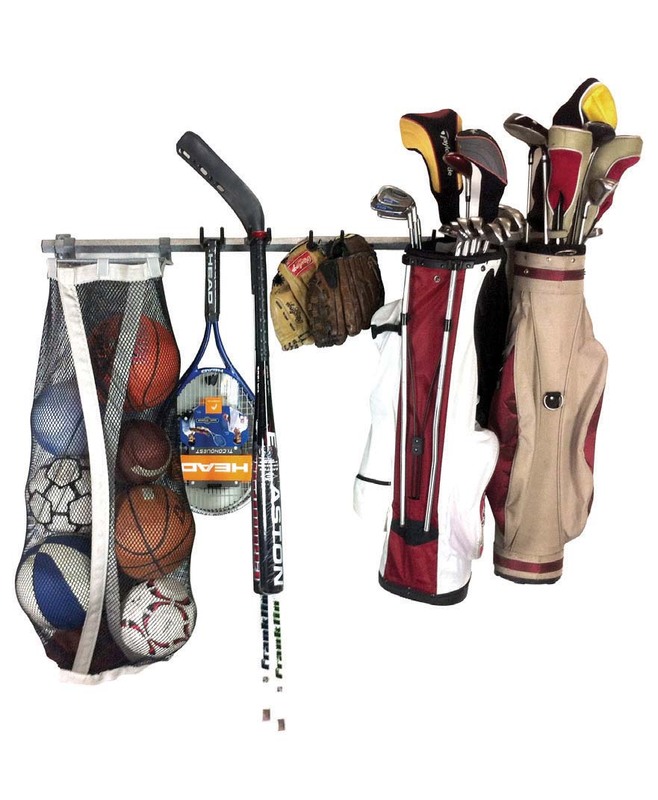 Now you can start organizing your sports gear.